As you may have noticed, we lean toward a bit of adventure in our lives. One thing our experience has taught us is that there is no substitute for knowledge. Whenever we begin a new activity, we want to learn everything we can. For us, that education process is a big part of the excitement. It is also the best thing we can do to keep ourselves (and others) safe, protect our investment in gear, and blend smoothly into the subculture of whatever activity we are taking on. We fly airplanes, tow travel trailers, ride bicycles, and now we boat. All of these activities are fun, but also carry some degree of (manageable) risk. In the airplane world, a great deal of safety is mandated by law. You must complete a very rigorous training, testing, and licensing regimen before you are allowed to fly an airplane. Piloting the other vehicles, however, is much more self directed. Even so, we still try to apply much of the same mindset to them that we learned in pilot training. All that theory is great, but it didn’t make us feel qualified to hop on the boat, fire up the 260hp diesel, turn on the chartplotter, GPS, radar, sonar, and autopilot, power up the bow and stern thrusters, throw off the dock lines, and head out to sea after hollering some kind of appropriate warning to the world on the VHF marine radio. We wanted professional help. That was a good move. Before you fire up the diesel, it turns out, you should go down into the engine room. You should make sure the appropriate seacocks are open. You should shine a light on the sea strainers to be sure they’re not clogged. You should check the glass bowl on the fuel filter. You should check the oil, look for any fluid leaks, inspect the serpentine belt, and be sure the electrical systems are up and working. The list goes on and on. If there is a problem with any of these things, you want to know early, while you’re tied to the dock in the marina – rather than, say, while being swept into a shipping channel by tidal currents while a 750-foot container ship full of Hyundais bears down on you at 20 knots. You should also know the forecast tides, currents, and weather where you are and where you’re going. On a smaller level, you should observe the wind, waves, and currents at the dock where you’re moored. In short, you need to be aware of the state of your equipment, the environment you’re launching into, and your own capabilities – before you go. It’s the same with all our activities, actually. In the Airstream, before you leave your campsite and head back out onto the road, you want to make sure your stabilizers are up, your tires are properly inflated, your hitch is correctly attached and secure, your safety chains and break-away switch are connected, your chocks are removed, your water, sewer, and electric connections are removed and stowed, the water pump is off, the orchid is safely in the sink, the TV antenna is down, the cupboards are all latched (especially the one with the walnut oil and truffle salt), your windows and doors are closed and secure, and you don’t pull away without your dang welcome mat (AGAIN!). In the airplane, of course there is a very detailed and specific checklist of items to complete before you launch into the sky (and adherence to that checklist – using the actual checklist – is required by law, by the way). Once you’re up and flying, you can’t exactly pull over onto a cloud and fix that thing you forgot to check on the ground. While some of these things seem obvious, you won’t be proficient and safe in doing them without some study, training, and experience. So, we closed on the boat sale (including filling out the paperwork to re-name her “Airship”), moved our gear on board, spent the first night on the boat in our slip at Cap Sante Marina in Anacortes, and met Captain Jack the next morning for two full days of on-the-water training with a Coast Guard certified captain running us through the procedures over and over. It was amazingly fun and challenging. We were drinking boat knowledge through a fire hose. After two days of training and three nights on the boat, Captain Jack pronounced us ready to head out on our first solo adventure away from port. So we headed out on our own from Anacortes to Friday Harbor on San Juan Island. 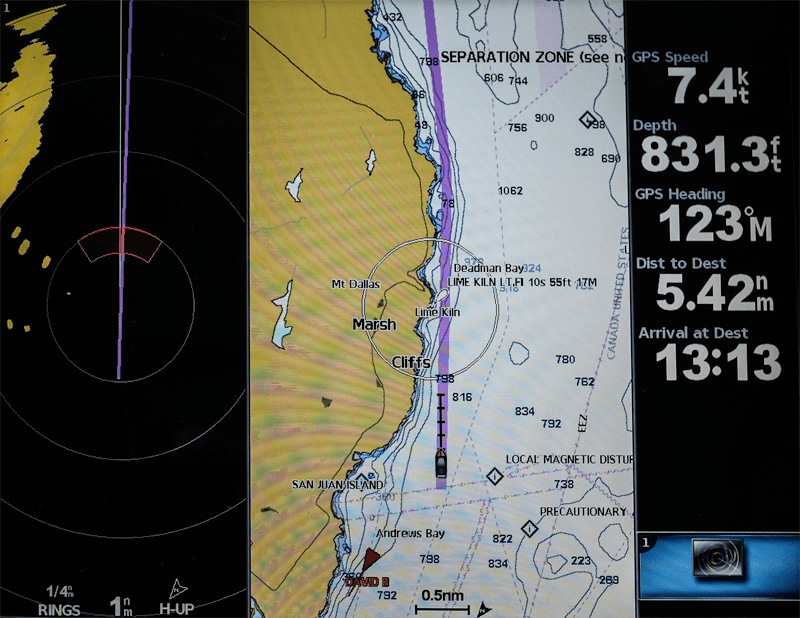 Heading out from Friday Harbor that next morning we encountered another new situation for us – navigating in fog. Flying the airplane under “instrument flight rules” (IFR) – where you can’t see anything outside and you’re flying completely by reference to your instruments – gave us at least a good foundation for navigating the boat in fog. The situation is very similar. In thick fog, you can see only a small circle of water around your boat. Everything else is pale grayish white. You have to know and trust your instruments, and have a plan of action before any dangerous situations arise. We moved slowly through the fog – six or seven knots at most. We created a course line using the “guide” feature of the Garmin system. 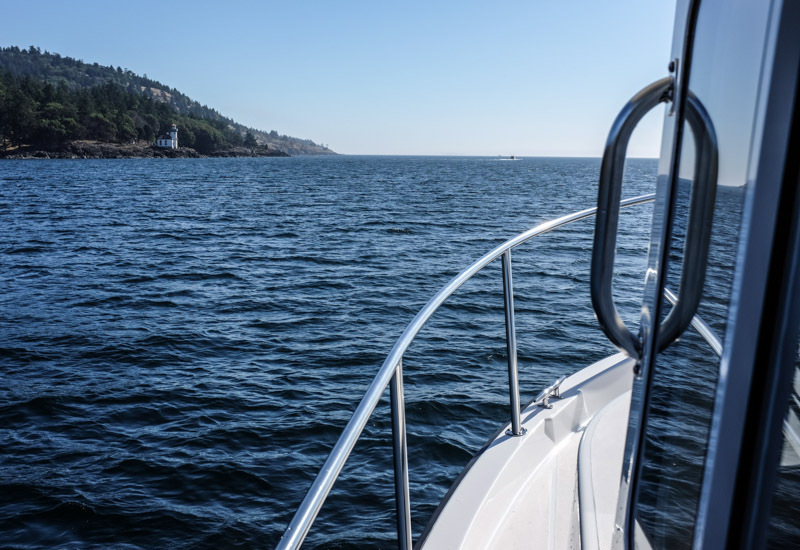 The Garmin will automatically calculate a route to your destination for you based on the information about your boat – minimum distance from shore and obstacles, minimum water depth, etc. You can then activate the autopilot and it will steer that course for you automatically. 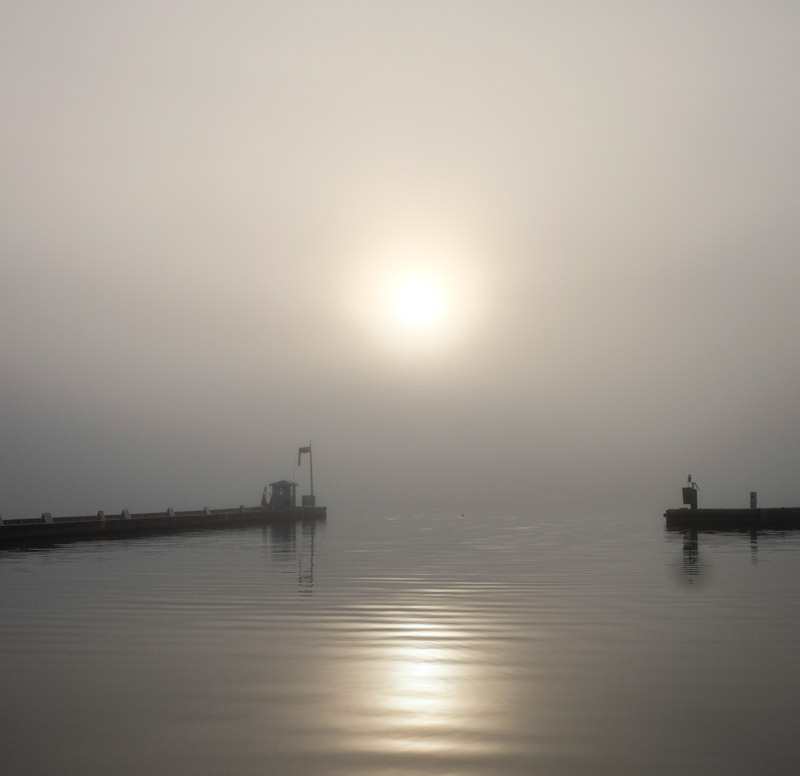 In fog, when you’re steering without any meaningful outside reference to look at (there are no white highway stripes on the water), the autopilot tracking a course greatly simplifies steering, and reduces your workload so you can concentrate more on other priorities – like not running into anything. We also had the radar powered up and running, and the navigation system has a nifty feature where you can overlay the radar image over the navigation charts. That helps you tell which radar returns are fixed objects like land, small rocks and islands, buoys – and which are other boats. 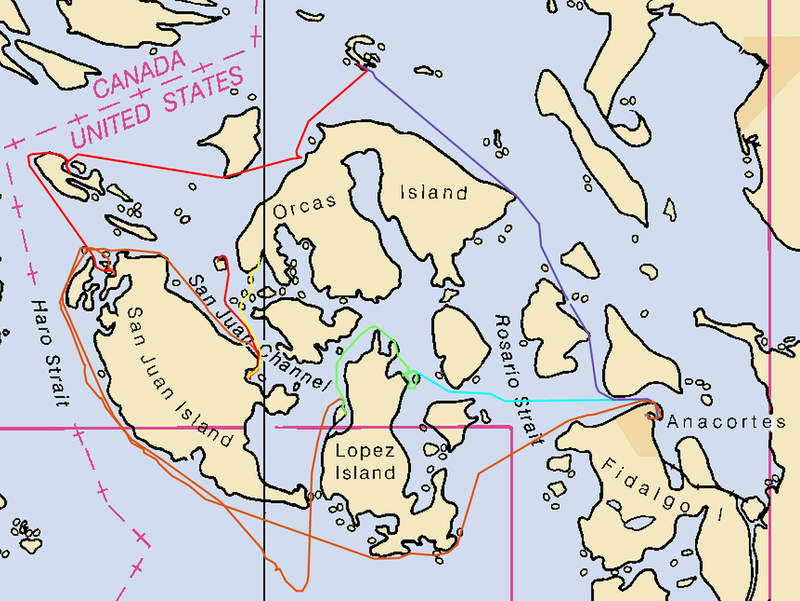 We also have an AIS system which knows the position, location, course, and other information about larger and commercial vessels and displays that on the chartplotter as well. It also sends our location back into the same system, so vessels with AIS systems can avoid us. Finally, we had the VHF radio on scan so we could hear the conversations of other boaters in the area. The combination of all that fancy gear gives very good situational awareness. We generally knew about other boats when they were several miles away. We could adjust our course to avoid them early, so we didn’t have to do any fancy last-minute evasive maneuvers. 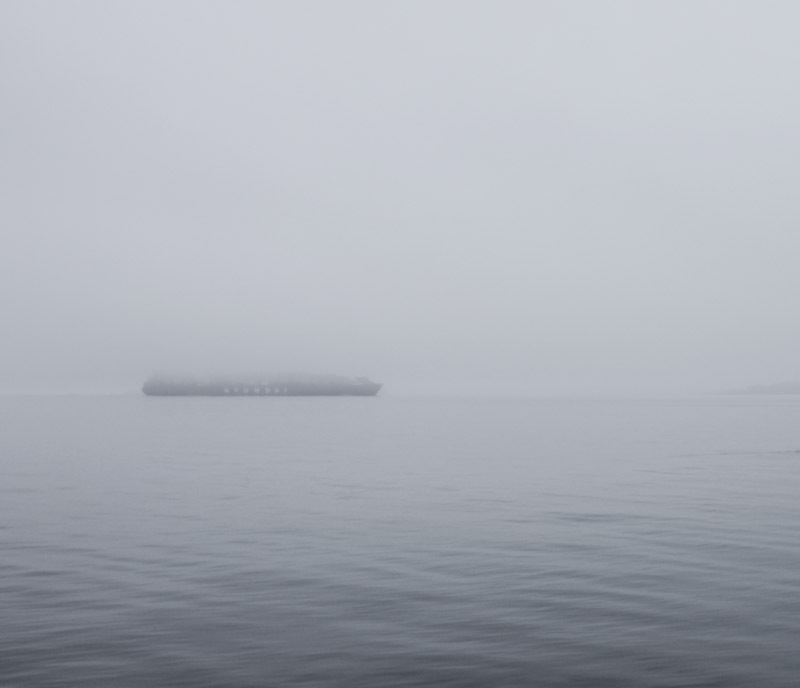 On the few occasions where another vessel did approach closely, it was fun to watch their blip on radar as it approached, and then finally barely make them out through the fog as they passed silently to starboard. In some cases, we tracked convoys of two or more boats – where the lead boat had all the radar, AIS, and GPS gear, and the other boats were following along behind, staying in radio contact, and using the first boat to guide them through the fog. After a couple of hours in the fog, we rolled around onto the West side of San Juan Island, the fog cleared, the sun broke out, and we had a gorgeous leisurely cruise around the rest of the island. Over the next several days we continued to explore and gain experience. We wanted to get used to living on the boat. We wanted to test out all the systems and gear as much as possible while we were still close by the dealer we trusted – who could readily address any issues we found. We wanted to get experience docking, mooring, anchoring, deploying and operating the dinghy, and managing the various resources like water, electricity, sewer, food, and heat. We found that living aboard the boat is very similar to living in the Airstream, and that many of the practices we’d mastered in the trailer – water and electricity conservation, living in minimal space and with minimal amounts of “stuff”, cooking, eating, cleaning, and organizing – all applied equally well in the boat. In many ways, the boat is actually more forgiving than the Airstream. You have a much larger fresh water supply (100 gallons). Grey water is not usually stored – it is pumped directly overboard automatically (so use environmentally-friendly dish detergent and shampoo). Since you’re driving the same vehicle you’re living in, the engine provides a lot of side benefits – heating the hot water, recharging the batteries, running one of the heaters – if you don’t just stay anchored in one place for days, the engine renews a lot of your limited resources for you. Some conveniences are new to us. While cruising in the boat, it’s easy to slip down to the salon and whip up a salad for lunch or some cappuccinos. 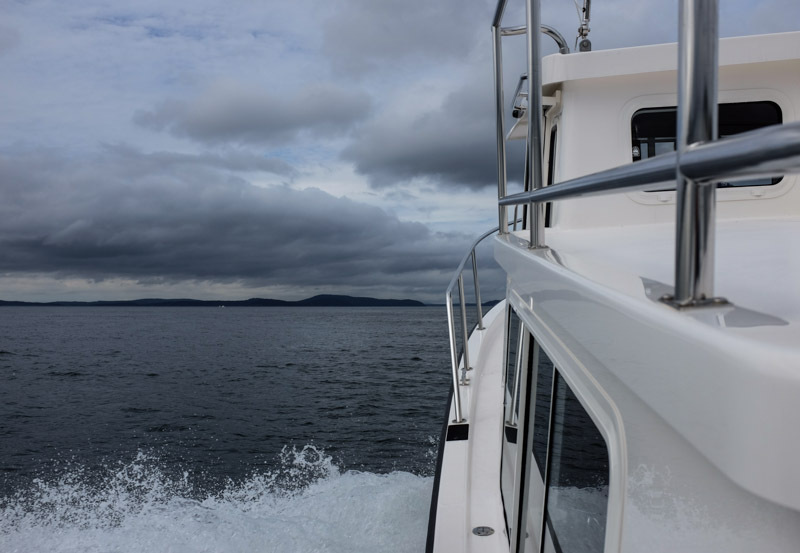 There’s plenty of space to enjoy them in the pilothouse while the autopilot holds your course and the radar and radio help you keep watch. It’s nice to be able to easily trade off skipper responsibilities, and to stretch out and walk around while underway. Cruising is very nice when you’re not strapped into a form-fitting seat with a shoulder harness. Fuel cost for the boat appears that it will be the lowest of any of our vehicles. At an economy cruise, the boat uses barely over one gallon per hour of diesel. Compare that to the F150 burning 5-6 gallons per hour on the freeway towing the trailer, or the airplane burning 16-17 gallons of avgas per hour at cruise. So, cruising for four hours in one day, the boat uses 4 gallons, the pickup/Airstream uses 20-25 gallons, and the airplane uses 68. However, turn that table around to miles-per-gallon and the results come out exactly the opposite. The airplane burns 17 gallons per hour at near 250 MPH, so it’s getting almost 15 MPG. The truck/Airstream weighs in at 10-11 MPG on the freeway at 60MPH, and the boat chugs in a paltry 7 MPG at economy cruise. In a four hour cruising day, however, you will have covered only 30 miles or so in the boat, 240 miles in the Airstream, and close to a thousand miles in the plane. Different tools are suited for different jobs. Airship is back in Anacortes now, and we’ve left her in the capable hands of the team at Nordic Tugs NW. They are doubling the house battery array, adding solar panels, installing an inverter, replacing the cooktop/microwave with a full propane range/oven, mounting a chest freezer on the upper deck, and installing our new industrial-strength “Moovbox” internet router so we can work as well from the water as we do from home or in the Airstream. We are very excited for the adventures that await. Next Post Why a Nordic Tug?